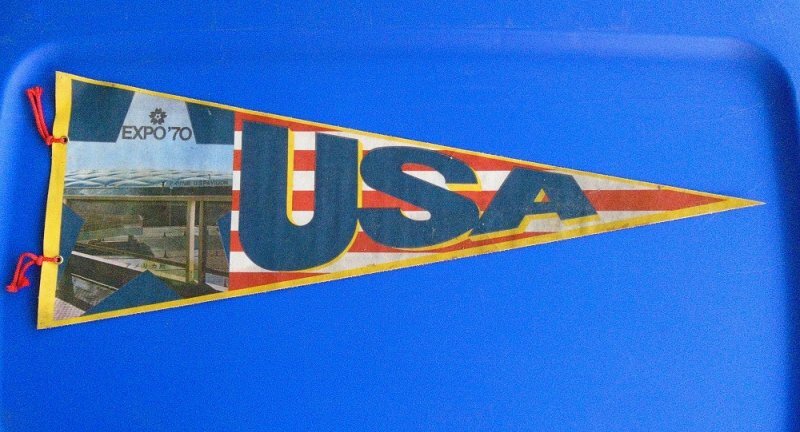 Vintage 1970 pennant banner from EXPO 70 held in Suita Osaka Japan. 23.25 inches long, multi colored. Estate purchase. I recently purchased a collection of a couple dozen small pennant banners at an estate sale. The informational card stated that they were from the 1950s to 1960s time frame. I can't prove those dates so am taking the sellers word for it. I believe this pennant is the only one from 1970. This pennant is from EXPO 70 that was held in Suita Osaka Japan. It is made of a felt type of material. The vertical side measures 8.5 inches long. The horizontal side measures 23.25 inches long. When held up to the light I can see tiny pin holes at the top and bottom of the long vertical side where a past owner must have tacked it to a wall. There are also two yarns on the vertical end to tie it to a rod for display. The colors are all still very vibrant. The pennant is slightly dingy in a couple of spots. I'd assume those areas can be cleaned with a tooth brush and laundry soap. There are also a few small stains which you should be able to see in my photo.